I’ve blogged about NUMA a couple of times in the past and we cover it extensively in our Immersion Events, specifically when discussing SQLOS and memory and scheduling management. One of the challenges with this is that laptops are SMP machines, so unless you have a server with hardware NUMA it is impossible to show the differences in how SQLOS boots up with or without NUMA, at least that’s what I used to think. 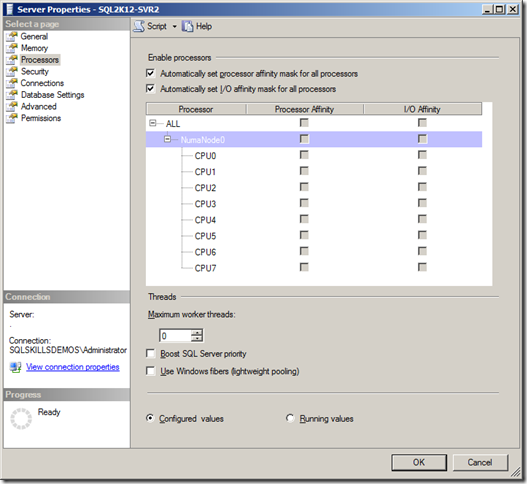 It turns out that in Windows 7 and Windows Server 2008 R2, the support for > 64 processor support and processor groups allows you to be able to fake a hardware NUMA configuration at the OS level for testing purposes. To show how this works I am going to use one of my test VMs running in VMware Workstation 8 on my Dell M6700 laptop that I use regularly for teaching and presentation demos. For the purposes of this post I have reconfigured the VM to have four CPUs with two cores each and 16GB RAM. 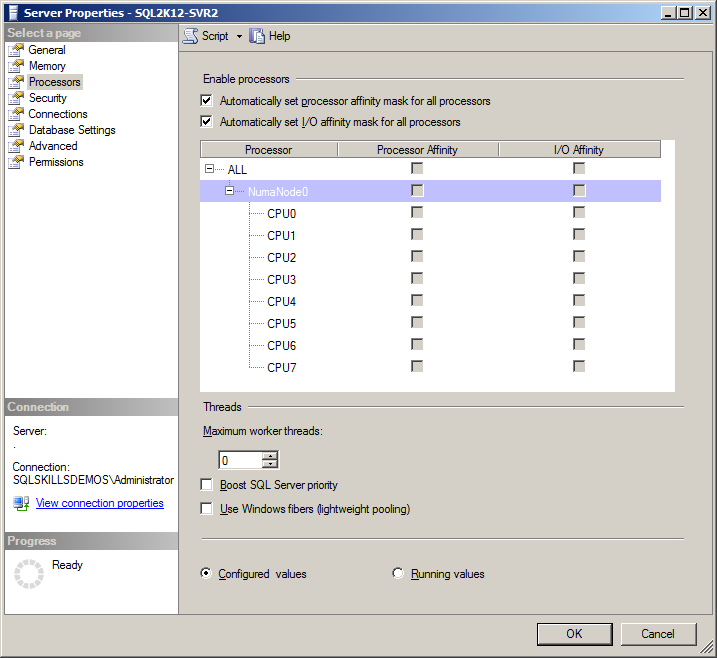 Under the default configuration of the VM has a single memory node presented by Windows to SQLOS so it starts up with a single NUMA node and all of the logical processors are assigned to that node, as shown in the Server Properties dialog below. 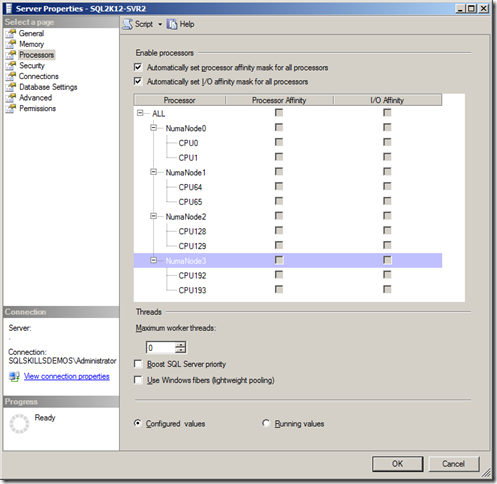 A fake NUMA configuration can be created by setting the groupsize value in the Boot Configuration Data (BCD) using BCDEdit to the number of CPUs that should be grouped into each processor group. The appropriate values are 1 to 64 in powers of 2. This isn’t documented in the standard BCDEdit documentation in the Books Online, but it is documented in the Windows Drivers development section. 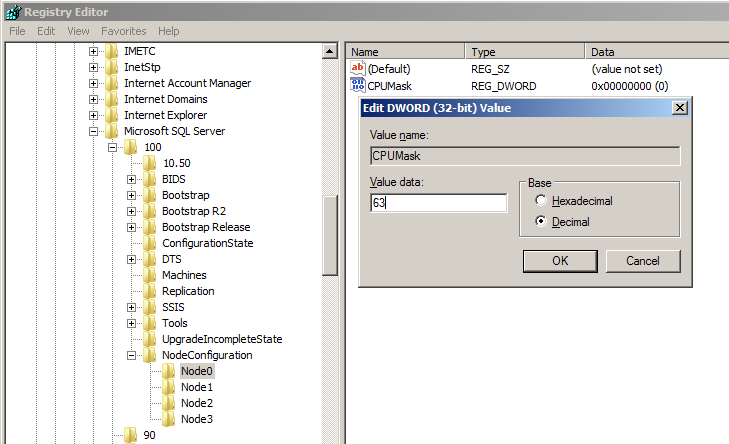 To use BCDEdit you have to be running from a elevated command prompt as a local administrator. For the purposes of this post I am going to use a groupsize of 2. After changing the BCD, it is necessary to restart the machine for the configuration changes to take effect to the configuration. 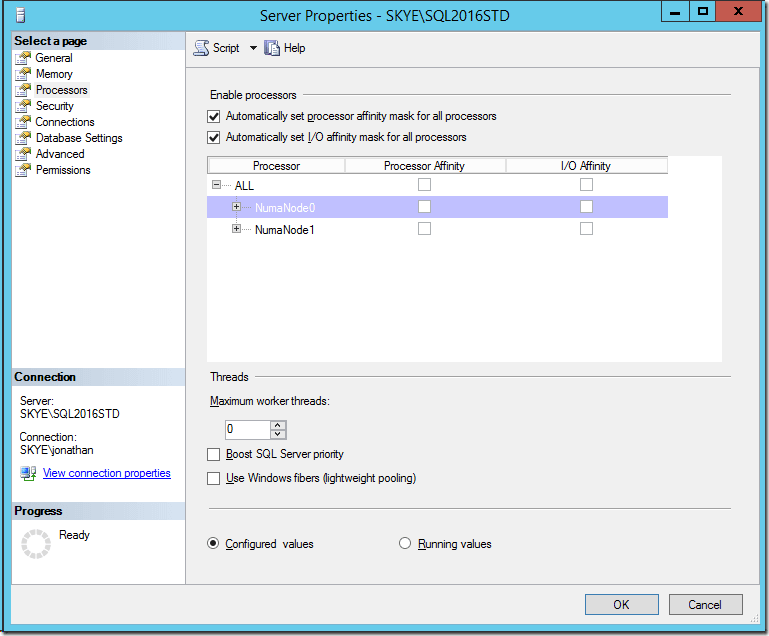 Disclaimer: This is not something you should do on a production SQL Server and this is only something that should be used for testing and/or learning about SQLOS on a non-NUMA hardware machine. After rebooting the server, if we look at the Server Properties in, we will have four NUMA nodes, each with two logical processors assigned to it. 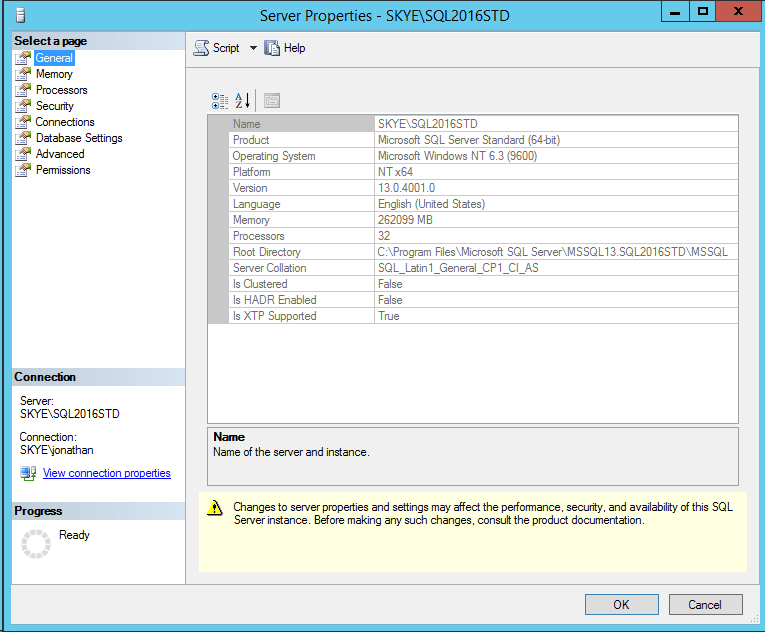 Looking at the DMVs in SQL Server will also show the changes to how SQLOS started up and configured the instance. 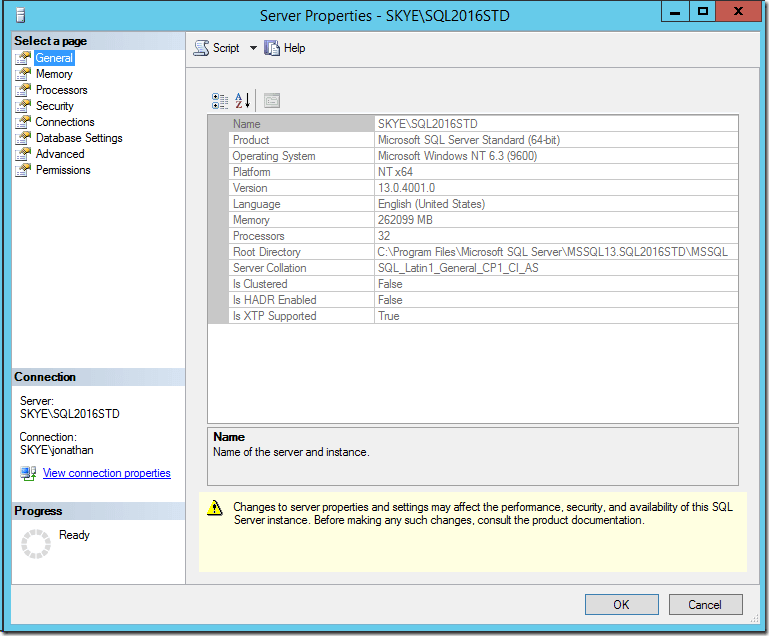 Keep in mind this is all false information, but you can really learn a lot about SQL Server and perform tests of behaviors under NUMA using this method. 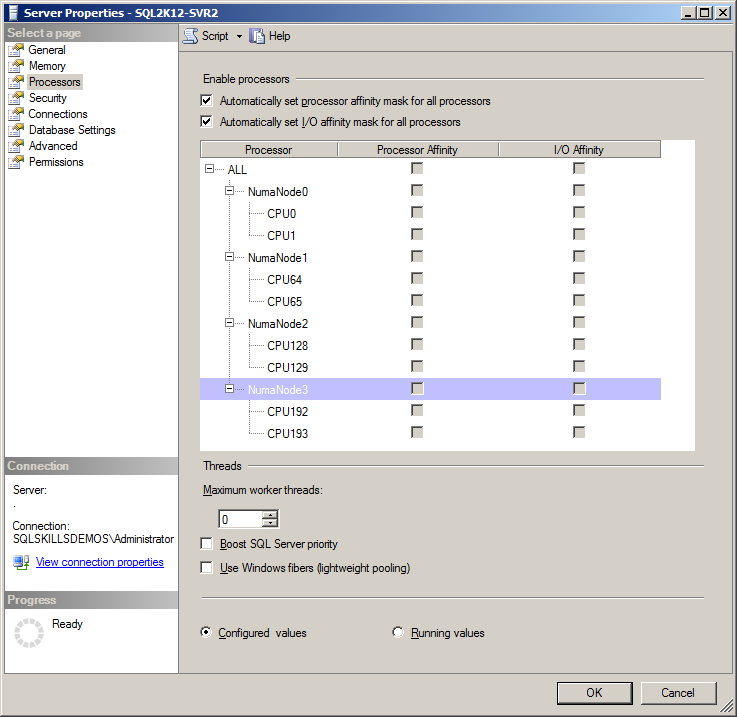 "The benefits of soft-NUMA include reducing I/O and lazy writer bottlenecks on computers with many CPUs and no hardware NUMA. There is a single I/O thread and a single lazy writer thread for each NUMA node. Depending on the usage of the database, these single threads may be a significant performance bottleneck. Configuring four soft-NUMA nodes provides four I/O threads and four lazy writer threads, which could increase performance." “Instance A, which experiences significant I/O, now has two I/O threads and two lazy writer threads, while instance B, which performs processor-intensive operations, has only one I/O thread and one lazy writer thread. " Perfect this is exactly what I was thinking, so now off to do some testing on one of my VM’s, and this is where I hit my first bump. I needed to figure out the appropriate CPUMask values for a 24 core system to subdivide it into four Soft NUMA nodes of 6 cores each, but the Books Online, and the available blog posts for the topic don’t make that very easy to accomplish and they don’t explain the basis of the CPUMask very well either. I was able to figure out with some testing, that the CPUMask is just a bitmask of the CPUMask values of the CPU’s that contribute to Soft NUMA node. Clear as mud right? The CPU Mask Sum column is the sum of the Masks for each of the CPU’s in the Soft Node and then the Node Registry CPUMask is the hexadecimal representation of the decimal value. 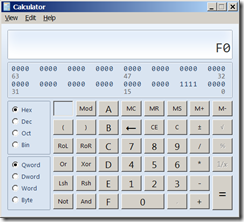 This can be obtained using the DEC2HEX() function in Excel, or by placing the Windows Calculator into Programmer Mode from the File Menu. 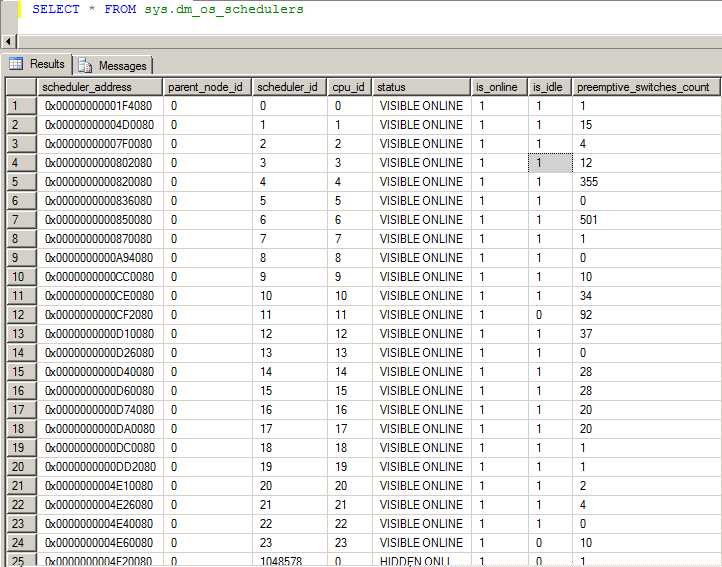 Now all I have to do is add the registry keys to create my Soft NUMA nodes. 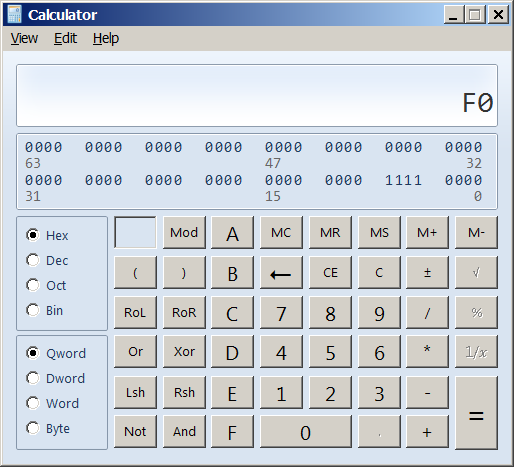 At this point I realized that I had really complicated figuring out the hexadecimal CPUMask values. 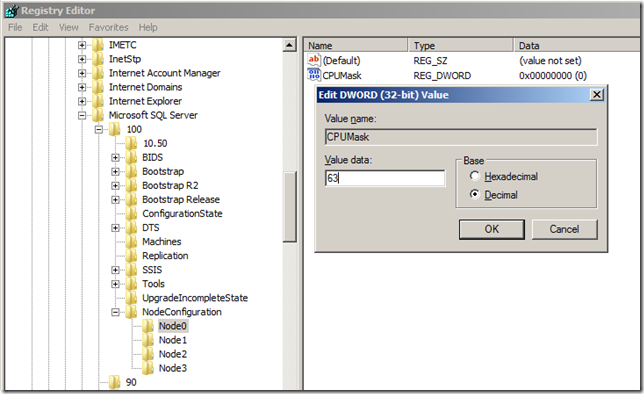 The DWORD registry value accepts the Decimal or Hexadecimal value in regedit, so you can skip converting the CPU BitMasks to hexadecimal, if you ever actually configure Soft NUMA for one of your servers. After setting all of the registry keys for my instance, and then restarting my instance I went back in to sys.dm_os_nodes to make sure that my NUMA configuration changes were correctly made. This is only a subset of the system sessions that actually exist on the instance but trust me when I tell you, all of the Lazy Writer threads are shown above; there is only one. So what happened here? 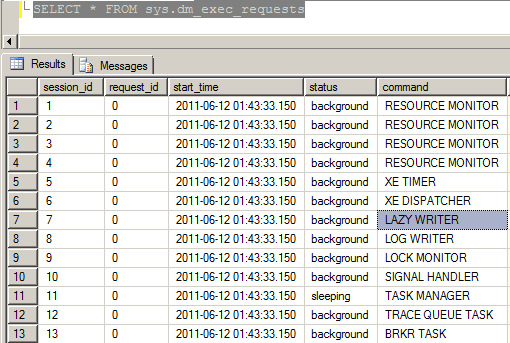 I have four Soft NUMA nodes, we confirmed that so why don’t I have any additional Lazy Writer threads? I was certain I had done something wrong here, so I sent tweet to Amit Banerjee (Blog|Twitter) a good friend of mine from the MSDN Forums who happens to be on the Product Support Team in India. It turns out that the Books Online is wrong about the benefits of using Soft NUMA, and this was pointed out a few years ago by Bob Dorr, another escalation engineer in Product Support on his blog post How It Works: Soft NUMA, I/O Completion Thread, Lazy Writer Workers and Memory Nodes. 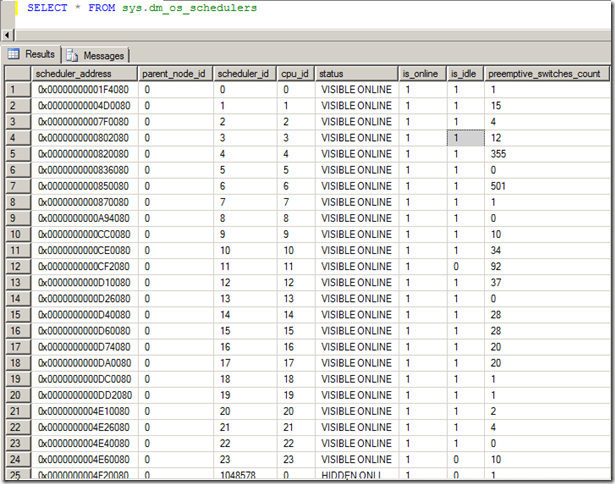 Two key points are made by Bob in this blog post; first that Lazy Writers are only assigned to Hard NUMA nodes, which map to SQLOS memory nodes, and second the IO Completion threads that are created per Soft NUMA node have nothing to do with Disk I/O, but are instead for connection requests and TDS traffic over the network. Based on this, I filed a connect feedback for the incorrect entries in the Books Online for Soft NUMA that will eventually see this incorrect information corrected. At the point that I realized this, I had just over four hours of time dedicated to figuring out how to make something work that will never actually do what I expected based on the documentation, but I had a much better understanding of how NUMA actually worked inside of SQL Server, which is something that had up to this point been a big mystery to me. 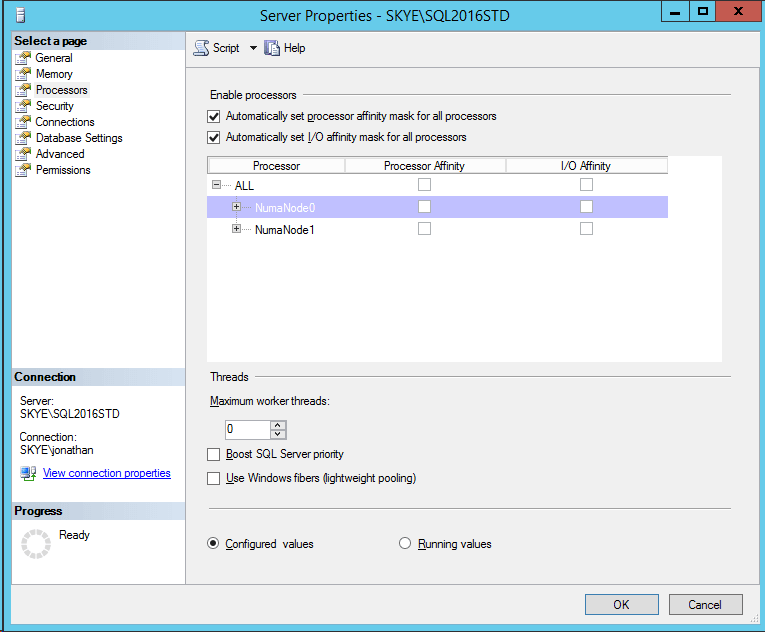 This leaves open the question, when would you actually make use of Soft NUMA in SQL Server, if it doesn’t actually provide CPU to Memory masking like Hard NUMA does, or provide any benefits of having additional Lazy Writer Threads? One use case would be to provide port affinity to drive specific connections to a specific node as discussed in the How It Works: SQL Server 2005 NUMA Basics blog post, also by Bob Dorr, but this only applies to serial execution plans and not to parallel execution plans as detailed by Bob in the NUMA Connection Affinity and Parallel Queries blog post. 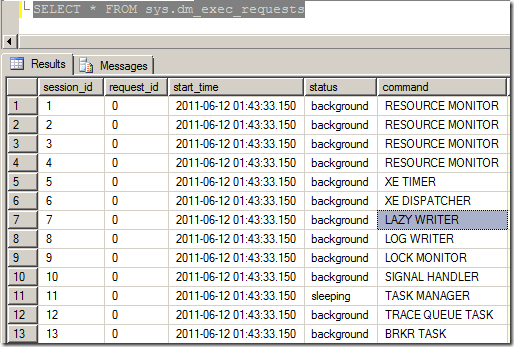 An example of where Soft NUMA usage is the ETL World Record set by SQL Server back in February 2008 which used Soft NUMA to balance the connection load as a part of achieving the world record of 1.18TB of flat file data loaded in 1794 seconds.